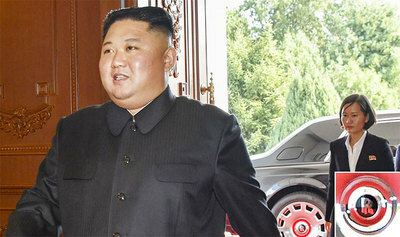 North Korean leader Kim Jong-un has given the families of senior Workers Party officials New Year's gifts of South Korean cosmetics, according to a source on Tuesday. The source said staff from the Workers Party's Finance and Accounting Department bought 1,000 South Korean cosmetics sets with dollars in the Chinese region of Yanbian in mid-November. They were given to the families of senior officials in the party's Central Committee on New Year's Day. Many of them then sold them in the markets. The regime regularly showers senior officials with gifts to buy their loyalty. Gifts normally included liquor and meat, as well as Swiss watches, home electronics and cars in special cases. But South Korean goods are normally avoided. "There seems to be a craze for South Korean cosmetics in Pyongyang," the source added, "and the regime is easing controls on South Korean goods to some extent amid the current détente." South Korean cosmetics are two to three times more expensive than Chinese or North Korean products but are in high demand in the markets. "South Korean cosmetics are one of the most popular wedding gifts a groom can give his bride in Pyongyang," said a defector who used to live in the city.